A conversation with communist rock star Taimur Rahman on class politics in Pakistan today. 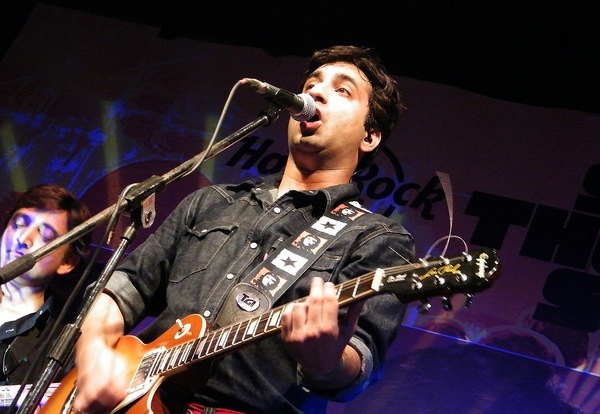 Taimur Rahman's band, Laal, performs at Hard Rock Cafe Mumbai. Last year, Pakistan’s government nearly fell. Denouncing alleged vote rigging in the 2013 general election, opposition leader Imran Khan organized what he called the Azadi March in protest. Supporters of Khan’s nationalist Pakistan Tehreek-e-Insaf party (PTI) demanded the resignation of Prime Minister Nawaz Sharif, the dissolution of the government’s assemblies, and new elections for the sake of a Naya (New) Pakistan. Beginning in August, there were multi-city marches, mass sit-ins, and attempts to shut down and paralyze cities to force Sharif’s hand. The protests continued for months until, on December 17, Taliban gunmen attacked the Army Public School in Peshawar, killing 145 people, including 132 school children, in one of the country’s deadliest terrorist attacks of all time. The set of events again signaled the weakness of Pakistan’s democracy, convulsed by military interference, hyper-nationalism, jihadist extremism, a rigid caste system, and the ongoing persecution of religious minorities. Khan’s protest effectively empowered the anti-democratic military establishment, which opposes Sharif’s more independent approach to foreign policy. Sharif’s center-right government — beholden to feudal landlords, US largesse, and the Pakistani military-intelligence elite — rests upon a tottering scaffolding of corruption. Taimur Rahman objects to both leaders. An accomplished academic, party organizer, musician, and internet activist, Rahman works as an assistant professor of political science at Lahore University of Management Sciences; serves as the General Secretary of the Communist Mazdoor Kissan Party (CMKP), a small socialist party popular with trade unions; and plays guitar for the popular Pakistani rock band, Laal (Urdu for “Red”). Yahya Chaudhry recently spoke with Rahman about his book, his band, and how to strengthen Pakistani democracy. Can you please explain your personal political development, class background, and your current position and support for the CMKP? I come from a family that is part of the bourgeoisie. But my parents were part of the Left since before I was born. And so their values and the values of their friends had a very deep impact on me during my upbringing. Hence, when I went to college I automatically gravitated towards a radical Marxist point of view. Looking back at my ideological development, I see it as being somewhat quite natural. When I came back from college, I joined up with the communist party (called Communist Mazdoor Kissan Party). And for the last seventeen years I’ve been working to advance the cause of Marxism in Pakistan. As a result I was chosen as the general secretary of the party. What were your experiences in the United States like, and what political lessons did you learn from your time here? Contrary to what people may think given my anti-imperialist views, my experiences in the United States were absolutely wonderful. I essentially became a committed Marxist during my undergraduate education at Grinnell College. And I learned much from the trade union movement, the AFL-CIO, Teamsters, and from various leftist parties while I was there in the United States. I think I probably would not have undertaken the radical course that I did with my life had it not been for that undergraduate education. What is the thesis of The Class Structure of Pakistan ? The thesis of the book is that the mode of production in pre-British India cannot be characterized as feudalism. It is a contention of the book that the characterization by Karl Marx and Frederick Engels of the Asiatic mode of production was more accurate, especially if one examines the forms of property, labor relations, and forms of surplus product. How did the mode of production in pre-colonial South Asia differ from European feudalism? Firstly, in pre-colonial South Asia there is no private property in land. Secondly, labor relations cannot be characterized as serfdom, but are organized according to the caste system. Last but not least, the form of surplus product is not a rent profit; it is a form of tribute (hence, some have called this the tributary mode of production). These three essential features that define any mode of production (forms of property, forms of surplus, labor relations) are fundamentally different between pre-capitalist Europe and pre-capitalist India. Asiatic capitalism is a transitory form (i.e. a social formation) that combines features of the Asiatic mode of production and capitalism. More specifically, it combines private ownership of land and commodity production with Asiatic labor relations (i.e. the caste system). The vast majority of nonagricultural employment is in the context of petty commodity production and small-scale capitalism. This of course implies that the organized labor movement has not come to dominate the consciousness of the working class because the lived experiences of the vast majority of the working class are not those of large-scale industrial production. Why is Pakistan’s development lagging? Its development is lacking mainly as a consequence of its class structure. The ruling class of Pakistan has a strange mixture of Asiatic and capitalist values, arguably combining the worst features of each of these modes of production. Aside from the development that occurred as a consequence of the vast amounts of foreign aid that Pakistan has received, indigenous capitalist development has generally not proceeded beyond the stage of handicraft and small-scale manufacture. Hence the large-scale industrial sector tends to be dominated by a handful of families that enjoy a monopoly on the most advanced means of production. To maintain this monopoly, they have supported repressive and autocratic military dictatorships. What reforms do you think can improve Pakistan’s economic condition and put the country on the road to development and worker empowerment? First and foremost, Pakistan is desperately in need of a comprehensive uncompensated land reform. Secondly, Pakistan desperately needs to find a way to break the monopoly of the principal industrial families in Pakistan. Thirdly, Pakistan needs state intervention to develop large-scale industry and increase spending in health and education. How do you diagnose Pakistan’s current political ills? Pakistan’s current political ills all stem from the class structure of the country. We have an ossified landed class, a backward industrial bourgeoisie, in part military dictators supported by US imperialism, and religious extremism on the rampage. But all of these things stem from one essential source: the class structure of the country. The Left in Pakistan has always been fighting an uphill battle. This is not only because of state repression, but also because Islamization campaigns, antidemocratic campaigns, anti-progressive campaigns, anti-secular campaigns have all taken root to some extent in the very population of the country. Hence, to be upholding secular socialist values is to swim against the tide, in fact to swim against a torrent. But despite these difficulties, leftists in Pakistan have shown enormous dedication to the cause and braved these odds. That is why I respect all of them, despite my theoretical or practical disagreements with others. What role do women play in the struggle for social justice and progressive policies? The role that women play and the role they should play are two separate questions. With respect to the former I’m afraid my answer would have to be very negative. Women have been progressively excluded from public spaces in Pakistan since Zia-ul-Haq’s Islamization drive. As far as our own views are concerned, without the active participation of women there can be no social transformation. Pakistan seems to have been in a state of crisis earlier this year during the Azadi March. How do you analyze Imran Khan’s democratic demands and his tactics in cooperating with the military? The use of democratic rhetoric for authoritarian purposes is nothing new in the history of Pakistan. Every major dictator, populist and aspirant to political power has always posed as a defender of the people while struggling for power. But the real test of the pudding is in the eating, as they say. And in this regard, the politics of the dharna have already demonstrated what we can expect in the future. By colluding with the military against an elected government — and by colluding with religious, right-wing forces — they have clearly demonstrated where they stand on the two most important questions in Pakistan’s politics. What is the greater threat to Pakistani democracy, the military or the Taliban? How do you support the military against the Taliban without empowering the anti-democratic generals and security services? This is like asking whether one prefers being cooked in a pan or in the fire. Since the 1970s, the military and the religious fundamentalist forces have enjoyed and continue to enjoy a very close relationship. If this relationship is now going through a turbulent period, it is only because the latter has decided that it is time for it to become the senior partner in this relationship. However, I do believe that these contradictions can and must be utilized by the Left in order to strengthen its own position. And the only way to do that is to, within the context of this historical period, work with the forces that represent, to use an old Marxist term, bourgeois democratic forces (i.e. those forces that oppose military dictatorship and religious fundamentalism). I’ve never quite understood the term political Islam. If one goes into the history of religions one discovers that all religions have always been political. The confinement of religious ideas to the realm of the private is a relatively modern historical phenomenon whose history can be traced to the rise of secular powers in Europe. In that context, then, Islamic fundamentalism is arguably a form of political Islam that is developed in response to the march of modernity. What role does music play in your political organizing and activism? It has gradually become more and more central to my politics and organizing. To play consistently good music one also has to practice and create new material. But I really don’t see my political activism and my music as two separate things. Some of the great intellectual movements of the past have occurred, or have been represented, principally through music. From Mozart to Bob Marley, music and social change have always been integrated with each other. You’ve traveled and performed across the region, visiting India a number of times. What were your experiences and what are your thoughts on the relationship between India and Pakistan? What surprised me about India was the warmth of the reception that our music and our message received. It was so overwhelming that it left us dazed and even a bit confused. We simply did not expect that we would be treated with so much love, respect, and honor in India. We have always hoped for, and work for, peace in South Asia. As we have repeatedly stated, both countries need to focus on their internal problems rather than waste precious economic resources on an arms buildup in South Asia. We have always emphasized that the construction of the “other” as an enemy has served only right-wing fundamentalist and communalist forces. You are very active on social media. How are you using the internet to promote your political ideals? I think social media is one of the most advanced forms of media available to mankind today. It allows for instantaneous free access across the globe. Gradually more and more people from various backgrounds are becoming part of social media. Hence, even workers and peasants are becoming integrated into the Internet world. For relatively small activist organizations, social media has proven to be incredibly effective and a powerful means of communicating our ideas. That is why we’ve placed so much emphasis on social media given the paucity of resources at our disposal and the need to reach out to as wide an audience as possible. Our social media page was shut down on instruction of the Pakistan Telecommunication Authority. We appealed this decision to Facebook and to the Pakistan Telecommunication Authority. We undertook a big campaign on social media as well as in the mainstream press which was very successful. And as a result of public pressure our page was restored. Pakistan has been convulsed by communal violence against minorities, including Christians, Ahmadis, and Shias. What can be done to reduce the prevalence of sectarian strife and prejudice? The state has to crack down against sectarian and religious extremist organizations. As long as the state does not fulfill its duty of protecting religious minorities in Pakistan, the public itself will continue to be a victim of these rapacious forces. There is simply no other solution at this point in history aside from forcing the state to protect the democratic rights of the people of Pakistan.